Hi everyone! I hope y'all had a great weekend!!! 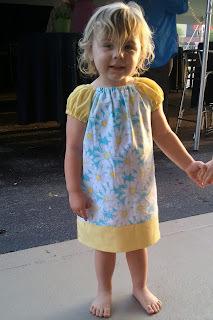 Here is the dress I made for a little girl at church for Easter. She not a ruffles and lace kinda girl. So I decide to go with something simple. A peasant style dress. I love the combination of the daisy fabric and the yellow gingham. It's so spring-y looking! This week I am going to do something a litt﻿le differennt. We all have people that have impacted our lives. Who made our lives just a little better. I have been thinking a lot lately about someone who made a HUGE difference in my life. My foster Mom was there for me at a time when I needed her most. She showed me love when I didn't know what love was. She helped so many foster girls!!! She put sooo much time and energy into helping each foster chold that was placed in her home. She genuinely cared for us and wanted to help us. She is an amazing woman!!! And I strive to be more like her daily. She didn't know us, yet she gave us a home and loved us as if we were her own. Had it not been for her I am sure I would not be here today. This week I am going to write her a letter. I want to thank her for everything she did for me. I will never be able to find the words to express to her thankful I am for everything she did for me, but I am going to try! Is there someone who has impacted your life? A friend, family member, teacher? I am going to challenge you also to write a letter and thank them. Well Ms. Nancy I must say it is darling. I love pheasant dresses n tops. Also plz let me know about the sewing project fornour lil heart patient. Still need a size and address to send to. Thanks. This dress is adorable!! I love the bright colors and flowers! I am going to have to think of someone to write to--great idea!